Most map elements are colour coded to give an indication of the severity of the current value. A scale to the left of the map shows how severe the current colour is. The values that the scale uses can be displayed by clicking on a map element. In the image below you can see the demand in QLD is about average. 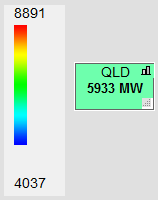 Clicking on the QLD demand box reveals that it is being scaled between 4006 MW and 8838 MW.